For a few years, we offered personalized surf lessons through Surf-O-Rama SurfsCOOL but we found that MOST of the students were quite proficient at learning the basics and hey, nobody wants to have to part with a lot of money if they don’t have to!!! So, what we’ve started doing this year is this: We put an entire surf lesson into print that we’ll give you for free when you rent a surfboard from us (for as little as SEVEN BUCKS!!!). The detailed instruction package covers everything you need to know from how to paddle, getting to your feet, observing beach conditions/rip currents, and safety tips/helpful information on all the equipment. We’ll also be happy to give you a dry land lesson showing you how to paddle your board, catch a wave and pop up to your feet. So, why pay $65.00 to $100.00 for a 90-minute lesson when you can get one for FREE from just one place in San Diego…Cheap Rentals Mission Beach!!! We also rent and sell rashguards and wetsuits if you want them as well as everything else you’ll need for a great surfing experience so…Save some money and surf more with a FREE SURF LESSON only from Cheap Rentals Mission Beach! One-on-one instruction to ensure you get the time, and the attention you need to grasp the basics. 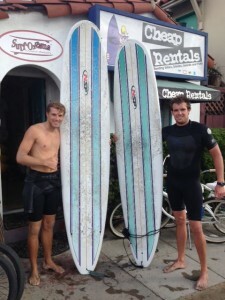 Great for beginners, advanced surfers, and weekend thrill seekers. Tell them Cheap Rentals sent you. So you are going to use Uncle Bob’s size-12 skates on your first day out on inline skates? … Forget about it! You wear a size eight. You’ll be swimming in those monsters. You’ll be so wobbly you’ll have trouble standing, let alone skating. Aside from that, you’ll develop blisters and spend most of your time on your backside. 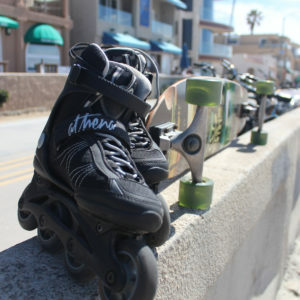 Do yourself a favor: Start with skates that fit! Would you have a serious conversation with a philosophy major without reading Foucault? Not without a shotgun! So don’t even think about hitting the pavement without your protective gear. It will save you lots of skin and might even save your life. To much is never enough.